Fashion Maven... Mommy: ECRU New York Holiday Collection GIVEAWAY! 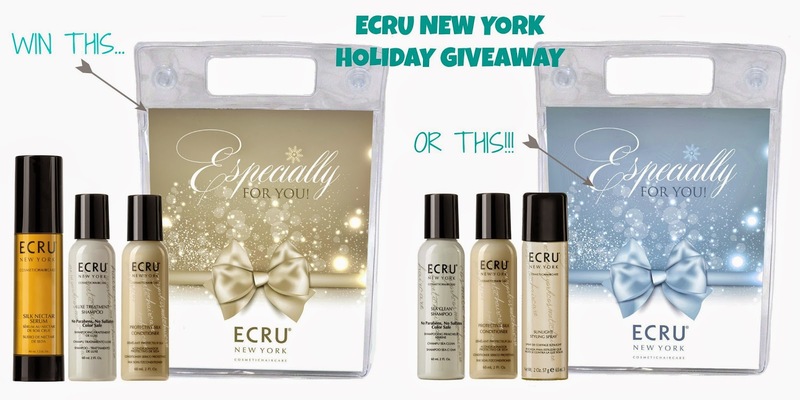 ECRU New York Holiday Collection GIVEAWAY! Congratulations to the winners of last week's giveaway Maria, Sherry and Shauna! If you were not selected, fret not! I have a new giveaway for you this week! Check it out! Giving away two sets of the ultra luxurious Sea Clean Holiday Collection and LUXE Collection, a Fabulous duo for the holiday season! GET LUXE! The second set contains Silk Nectar Serum (40 mL), Luxe Treatment Shampoo (2 oz), Protective Silk Conditioner (2 oz), valued at $36! Like Ecru New York on Facebook and follow on Twitter. Like Fashion Maven Mommy on Facebok and follow on Twitter. Join Fashion Maven Mommy via GFC.